This recipe came about when my dad brought me a nice bag of quinoa saying: "I won't not use it anyway, I bought it but do not know what to do with it!". At this point I had to rack my brains as I wanted to make a tasty vegan dish for some friends during one of my impromptu dinner invitations. 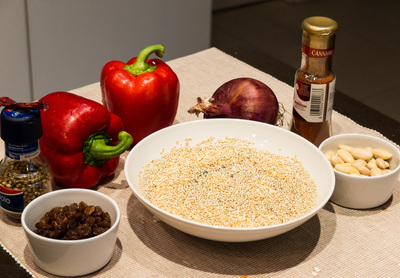 The only time I had tasted a quinoa salad, I found it slightly bitter, so I thought of matching it with sweet flavors such as red pepper and red onion. I also wanted to give it a more Moroccan note (like when making couscous, although quinoa is not a cereal, as many believe) so I added raisins, toasted almonds, some cinnamon and paprika. As a final touch I added some fresh mint leaves and ended up with an exquisite vegan dish that I would love to share with you here. 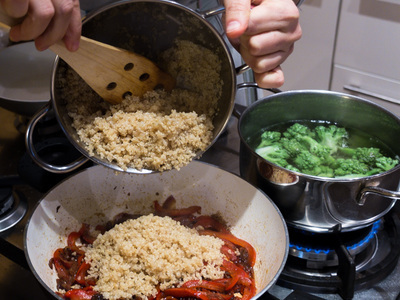 First of all, soak the quinoa for 15 minutes, then wash it well, rubbing it thoroughly between your hands. This will make it easier to remove the outer layer of saponin, which gives the bitter taste to these seeds while so protecting them from pests. Rinse generously until the water becomes clear. Only then cook the quinoa by putting it to boil in a lidded pan, using 1 cup of quinoa and 2 cups of water, for about ten minutes. 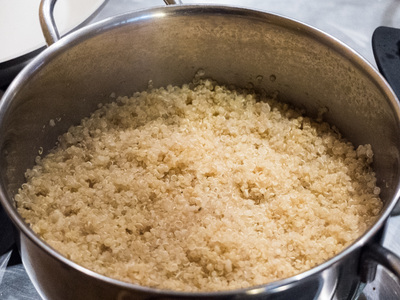 Once the water has been absorbed completely and tiny holes appear at the surface, your quinoa is ready. 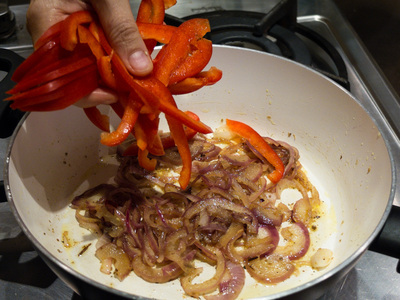 Meanwhile, thinly slice the onion and cut the pepper into strips. Heat up a tablespoon of oil in a frying pan and fry the spices (coriander, cinnamon and paprika), then add the onion and saute everything on medium heat for about ten minutes. 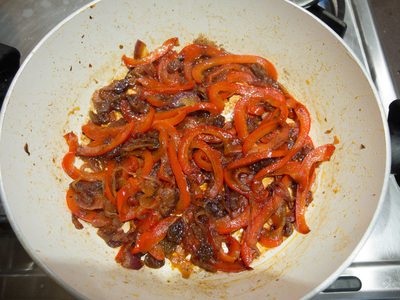 Then add the peppers, season with salt and cook for another ten minutes. 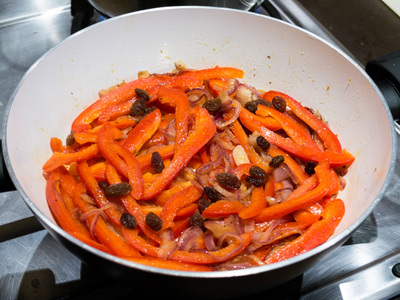 Once the peppers soften, add the raisins, a tablespoon of brown sugar and a splash of balsamic vinegar and caramelize. When the peppers are softened, add the raisins, a tablespoon of brown sugar and a splash of balsamic vinegar and let caramelize everything (if you need to, add a few tablespoons of water). 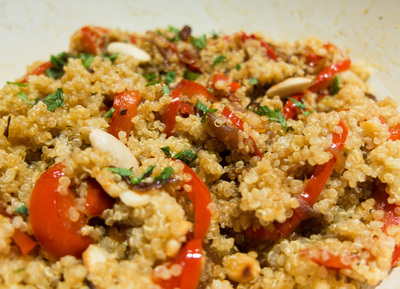 Finally add the boiled quinoa and complete the dish with toasted almonds and a good sprinkle of chopped fresh mint. Wash the cabbage and cut it into florets. Blanch for 5-6 minutes so it remains crisp. Once drained the boiling water, immerse the blanched cabbage immediately in ice water to maintain its beautiful green color. Prepare the yogurt sauce by adding mustard, lemon, a pinch of salt and finely chopped mint (adjust the sour note of the sauce to your taste). 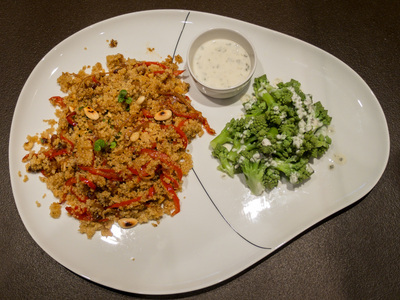 Season the cabbage with the yogurt sauce and you will have a side dish that matches divinely with the quinoa salad.